Please support our corporate sponsors as they have so generously supported our club. If you would like to become a club sponsor, please visit the Membership page. Home of top quality nishikigoi. Serving the international koi community for over 40 years, the Kodama family is dedicated to bringing you the finest Japanese koi from Japan. We have a large variety of beautiful high-quality koi. 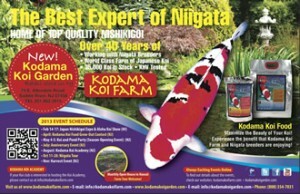 A world class farm of Japanese koi – over 35,000 in stock. KHV tested. Locations in New Jersey and Hawaii. 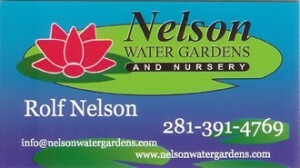 Nelsons Water Gardens & Nursery is a retail garden center in the Houston area that specializes in water gardening. Visit Nelson’s and you’ll find ponds, koi, goldfish, waterlilies and other aquatic plants. We also carry water features of every type imaginable from the classic tiered fountain to carved basalt and granite pieces. Contact Rolf & Anita Nelson. Lone Star Koi Club Rate just $89 a night. Treat yourself to a little rest and rejuvenation. 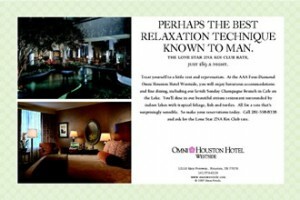 At the AAA Four-Diamond Omni Houston Hotel Westside, you will enjoy accommodations and fine dining, including our lavish Sunday Champagne Brunch in Cafe on the Lake. You’ll dine in our beautiful atrium restaurant surrounded by indoor lakes with tropical foliage, fish and turtles. All for a rate that’s surprisingly sensible. So make your reservations today. Call 281-558-8338 and ask for the Lone Star ZNA Koi Club rate. Our goal is to deliver you the best koi at a responsible price. Whether you are a dealer, seasoned hobbyist or just a beginner we want your business. Be sure to check out their photo tubs.